Porsche Repair Chesterfield: Is Your Porsche Ready For Spring? Is Your Porsche Ready for Spring? Hello, and welcome back to our blog! In our previous post, we started covering some of the spring maintenance tips that you need to perform to ensure that your Porsche is running the best that it possibly can. In today’s post, we are going to cover a few more maintenance tips for you to follow and we hope that by the end of this blog you feel confident in the knowledge that your Porsche is ready to handle anything that spring or summer may throw at it. If at the end of this post you realize that you need help performing these maintenance steps, contact that experts at Kudos Import and Performance. We’ve been helping Chesterfield luxury import owners for years and we are confident that we can handle any issue that your Porsche may be experiencing. When it comes to Porsche repair and maintenance, things don’t have to complicated. While more intricate mechanical work does call for the expertise of someone who is used to dealing with import automobiles, many of these maintenance tips can be completed at home by the driver. Below, we have listed a few things that you need to check before unleashing your Porsche in this warm weather. Tires: As we all know, winter is not particularly nice to tires. Cold temperatures, hazardous road conditions, and road salt all do their best to inflict as much damage as possible on your vehicle’s tires and it is up to you to make sure that they are good to go once spring comes around. Inspect your tires and make sure that there is still adequate tread and that there is no damage to the sidewall. If you have the air pressure in your tires calibrated for winter, we also suggest that you use this time to set your tire pressure to warm weather levels. Brakes: Pretty much everyone can agree that the brakes are one of, if not the most, important parts of your vehicle. Without your brakes you cannot stop and we are willing to bet that everyone wants to be able to stop their vehicle. As we mentioned in the previous bullet, road salt and harsh winter conditions can damage your brake lines and brake pads if they are not properly rinsed off after being exposed. Before gearing up for the spring, take a moment to check the entirety of your braking system. If you find an issue, call us immediately at Kudos Import and Performance. Damaged brakes can quickly turn into a serious problem. Air Conditioning: Our last maintenance tip, and one that people often fail to remember, is to make sure that your air conditioner is properly working after months of not being used. Like many things in life, we tend to forget things that we don’t use often. When it comes to air conditioning, however, you don’t want to forget about it once it is too late. Trust us, making sure that your air conditioner works properly before you need it the best course of action. 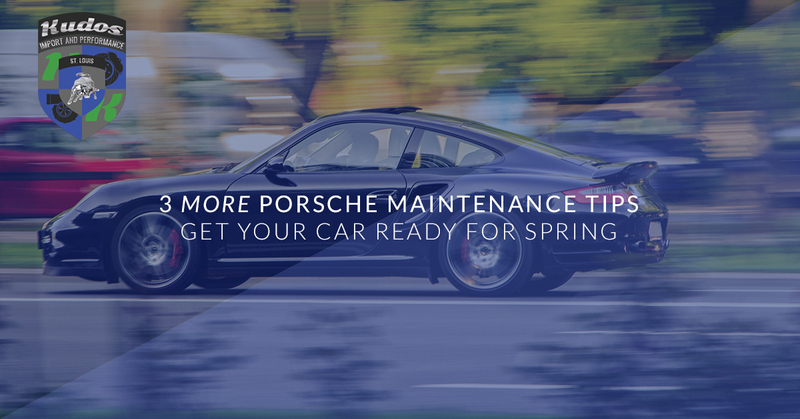 We hope that these tips have been helpful and that you use them to make sure that your Porsche is ready to go this spring. As we said before, if after reading this blog series you feel that you need to have your Porsche looked at, contact us today at Kudos Import and Performance. We will run a full diagnostic on your Porsche and make sure that it is ready to run.